Vijay Shekhar Sharma, founder of One 97 have released a list of upcoming sale on the e-commerce turned mobile recharge website PayTM. Vijay has secretly released the list of the smartphones and electronics which company is going to offer at never before rates on an upcoming day. The sale is going to last for 5 days and has many offers for the customers. The PayTM Rush Hour Sale is going special for the customers having the willingness to purchase Apple products, according to the information provided, the offer is going to last for only 5 days. iPhones would be in the spotlight of this sale. With great discounts on iPhones and other electronics, PayTM is targeting out huge revenues. There would be total 3 sales in the period of 5 days for iPhones. The First day would be on the opening day of 18th Jan with iPhone 6s. 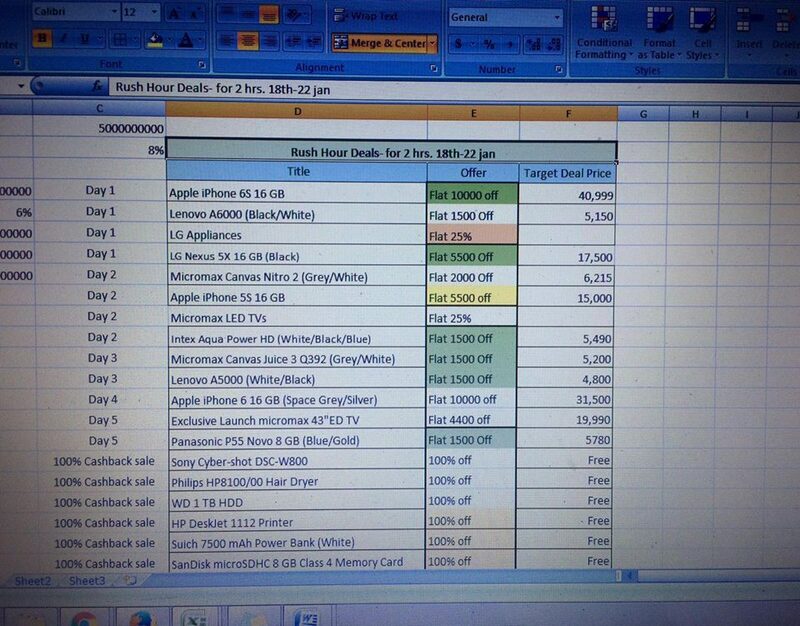 Second sale would be of iPhone 5S on 19th of January. While the third sale would be on Day 4, i.e, 21st of January. You can check the complete list of sales that would be available, below. Apple iPhone 6S 16 GB – The Deal would be available for 16GB handset variant only and it would be available for the day 1 which means starting at 11:00 AM and ends at 1:00 PM.